While we’d rather keep the focus local to state politics, the national action right now is hard to ignore, what with Trump tramping all over every decent element of democracy, much less progressive values and all. And Facebook churns endlessly the articles that people pick up and thrown amongst each other, many like hot potatoes because they are so absolutely abhorrent in thought and character that no one can hold onto to them for very long as they gasp in horror. Which was excerpted from an article that rationalized kids being thrown into the workforce written by one Jeffrey Tucker who so impressed Mr. Joseph Sunde (of the pro-charter anti-public school group the Acton Institute) that he, Mr. Sunde then decide to burp up a smelly piece all by himself to salute to those fine standards and values such as work. Intellectualism he says, is highly over-rated! Well, we can easily understand why Mr. Sunde would feel that way, but that doesn’t mean we shouldn’t continue to try to teach the rest of our children. Anyway, here’s my thoughts banged out quickly on the old keyboard. Enjoy and please, feel free to stop in over at Mr. Sunde’s site and give him a howdie and a schooling, because he desperately needs some of that intellectualizing! What a bunch of absolute drivel! While kids have shown to statistically be entering the workforce less, by and large the ability to make that choice is a luxury still only afforded to kids in the upper and middle class. Working class kids still often have to work as soon as 14 years old (yes there are states like the one I live in that allow kids to work limited hours at 14), not necessarily to supplement the family income but to have anything for themselves. I know my three children had to and my interactions at work with many younger people bears that out; children in lower income families are usually told pretty early on that they will have to start providing for the extras of their needs outside of food and shelter, which the parents still provide. Many have to work to buy their first car, buy school clothes or have any money for extras for social activities. Other than that, middle class kids chose not to work because most are engaged in activities in school or outside school to prepare them for college; sports, clubs and other activities. Much of this silly article centers around the even sillier commentary from Jeffrey Tucker, whoever he is, who seems to have slept through history class on the days when they talked about the brutality of labor in the 19th century. He apparently also, it appears never worked a low-wage retail or laboring job his entire life because not one single person who does feels that it uplifts their soul, raises them to new heights or whatever fantasies he applies. Obviously this young worker is having a grand time whilst planning her great future in industrial ownership and entrepreneurial undertakings! Its damned job. A job, a soul-sucking, mind-numbing job where instead of typing your thoughts on a computer and somebody thinking your words mean enough to put in a column, you are told to shut up, do the job or get the hell out for the next one. And at the end of the week, when you receive your paycheck, unless you are a kid with someone else paying your way, you will again feel that soul-sucking sensation when you look at the meager pay you received for your 150% effort. Now you can decide, do you pay the light bill or rent? Now getting back to the mind-numbing, soul-sucking part. We have a democracy. In a democracy we need our citizenry to be able to make basic decisions about their future and that of the country when they choose who to vote for. Hopefully they will make a good and sound decision after considering all the elements at hand. Children in Pennsylvania coal mine. No doubt the adult oversee has the best intentions in mind with that cane in his hand and taught valuable lessons in business skills and capital acquisition. 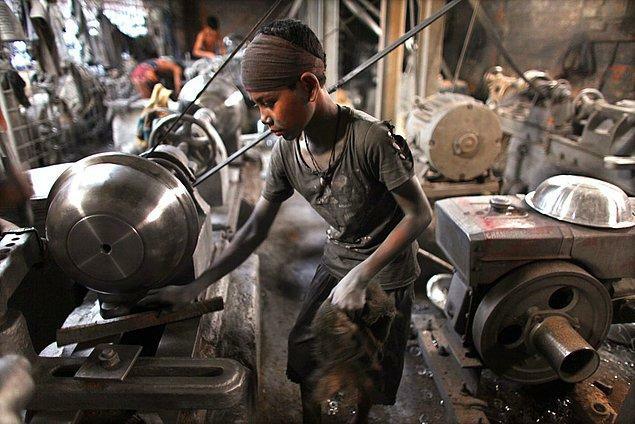 Why have we never heard from all these child laborers of days gone by? Where are their memoirs? Their riches and fine houses? Their stories of winning the golden ring? Lo! But that requires an education! And I’m not talking about just knowing the basic three R’s like arithmetic and reading and writing, I’m talking about critical thinking, history, civics and the rest. Already we have a Christian-based right-wing nutbag organization in Texas that does the final decision making on high school text books and you know what we have? We have a population that is about one third ignorant, sexist bigots and then another portion of privileged jerks who write columns saying that it isn’t important for certain peoples in our fine democracy to have a clue what is going on in their country. I suppose your resolution for that Mr. Sunde would be to just take away that problem by removing them from the voting roles! Hey, after all, as it is we have a problem with people getting to the polls because employers won’t let them go. Children need the nurture that comes from a healthy family and community throughout their childhood and that childhood is also during their teens. Girls and boys need to be engaged in activities that are safe and regulated by adults that care about their development. They don’t need to be thrown to the wolves to be exploited by corporate monsters out for every buck they can squeeze from anyone, even children. Children died working in mines and mills, they were horribly disfigured, disabled and often were malnourished and diseased. They most often did not attend school, were largely illiterate or semi-literate and never had the pleasure of enjoying the chance to reach their own potential as unique individuals. Many died before they reached the twenties from disability and occupational disease. But what’s most important is that almost all of them suffered from the deprivation of guidance, love and security that children need in order to grow into productive and emotionally healthy adults and contributory citizens. 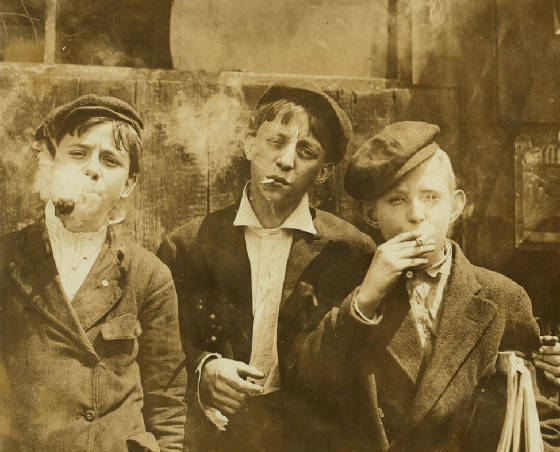 Newsboys in St. Louis, 1910, picture by Lewis Hines. Here we see how children at work learn all sorts of fine habits from the adult environment they are exposed to. As it is already children who start working early often lose interest in academics unless their parents hold a hard line on them. Employers will pressure them to work later than they should and their exposure to adults as a large part of their social upbringing is not always a positive thing; its the type of adults and the types of activities and values that children are exposed to that can make a positive or a very negative difference in their lives. In addition, neither middle school aged nor high school age kids have the ability to determine for themselves when they are being exploited by adults or not. This is absolutely the dumbest piece of commentary I’ve read in a long time and it represents a frightening trend in our society. It reflects the idea that many have adopted that the lower sector of society, from children to adults, is disposable fodder to feed the endless greed of corporate machinery. I don’t know who paid you or your colleague Mr. Tucker to write such garbage, or how much, but for selling out your soul intellectually the way you are apparently willing, your God will have judgment waiting for you.